I voted! About.com's Readers Choice Awards poll on the Beadwork forum is a bit irritating to navigate but if you're a fan of beadwork teachers, books, magazines, shops and shows, you might want to weigh in. The poll is open until March 15. Art has the classic ability to reflect and comment on the larger cultural processes taking place around it. While neomexicanidad (neo-Mexicanism), an artistic tendency that emerged in Mexican art of the 1980s, has often been regarded and dismissed as strictly folkloric, others argue that there are many sources of inspiration for neo-Mexicanist art and that it expresses a range of attitudes toward national identity and institutions that include humor, nostalgia, irreverence, and subtle criticism. 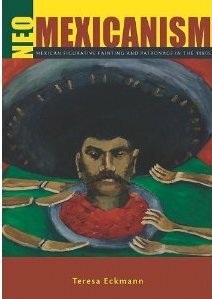 In this analysis, Teresa Eckmann proposes that 1980s neo-Mexicanist art is infused with an undercurrent of disenchantment that reflects personal responses to the economic and social stagnation, low foreign investment, natural disasters, political corruption, oppression, and general state of crisis that marked the decade. Neo-Mexicanist art has not typically been the subject of critical study. Eckmann attempts to fill this void in scholarship, addressing such important questions as how neo-Mexicanism has been defined, what its motivations and influences are, how it has been promoted and interpreted, and to what extent that patronage has influenced the development and construction of the movement. Teresa Eckmann is assistant professor of modern and contemporary Latin American art history at the University of Texas at San Antonio. Her published works include No Bounds: Luis Cruz Azaceta, The Latin American Poster: Image, Message, and Means, and Chicano Artists and Neo-Mexicanists: (De)Constructions of National Identity.